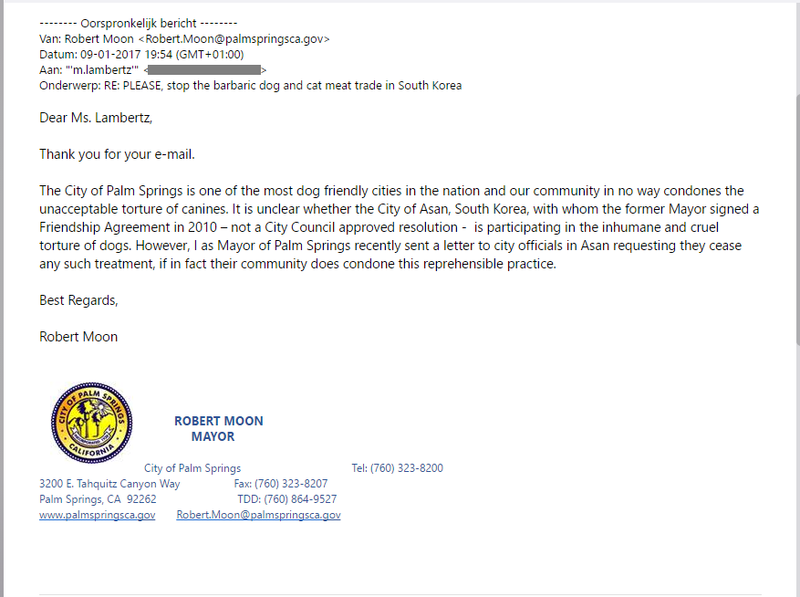 Mayor Robert Moon of Palm Springs has replied to our Asan Friendship City campaign/petition that we sent to his office (see below), and we are pleased to say that he has responded positively. He stated that he sent a letter to the city officials in Asan requesting that they cease this “reprehensible practice” . We would like to thank him and the members of his office for listening to our concerns and taking action. I would like to thank you for responding to our concerns raised via the recent petition on Change.org about the mistreatment, torture and consumption of companion animals in Palm Springs’s Friendship City Asan. Thank you so very much for responding to the recent petition on Change.org. The dog meat trade really needs to end and be banned for good. These poor companion animals do not deserve this horrendous treatment and cruelty beyond belief. Thank you so very much again for anything you can do to put an end to this. Thank you, Mr. Moon for taking action to put an end to the barbaric dog meat trade in South Korea. Anyone who has an involvement with that country needs to put pressure on the officials to end such a cruel, inhumane practice. These dogs cannot speak for or defend themselves so it is necessary for us to do all we can to stop the dog meat now. Thank you for your support to help stop the torture of dogs used for meat!